So I had a random act of kindness bestowed on me today. As some of you know I am in the bulk mail business and right now we are in the height of political season. It get extremely chaotic and I have to draw upon all my organization and prioritizing abilities just to get through the day. Not complaining, just painting the picture. My wireless decided to act up, I narrowly escaped a laptop BIOs disaster, my new expensive tabbing machine accidentally came crashing down to the concrete floor, and a customer had me researching and calling all over for his “missing” mailing, when in fact it was not missing at all. He was polling people to see if they had gotten his mailing and they were telling him they had not, but what he didn’t realize is that none of these people were on the list he sent me. Oh how sweet it was. She even had 1/2 vegetarian for my daughter to eat. Can’t tell you how grateful I am for this RAK. For so many reasons. Thank you Debbie for always showing me how wonderful life really is. Random me: Pizza is one of my favorite treats. It’s hard to believe the 100 day challenge is over. 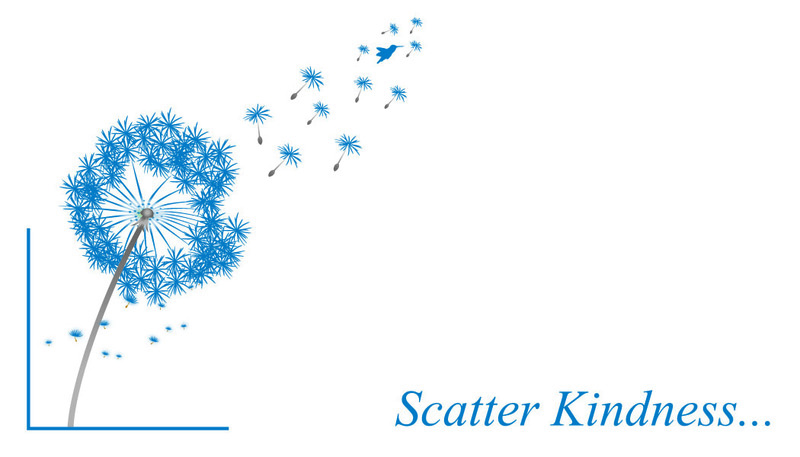 First I want to thank all the participants from the bottom of my heart for helping me scatter kindness. It was fun, interesting and far less a challenge than I first thought it would be. I hope you enjoyed and please keep the ripple effect going. Random me: Another great idea is to lay unwanted coupons on the product at the store, and the person that wants that product can use them. #100 Random Act of Kindness – 100 day challenge. What a winter this was! Great job to all the snow plowers out there and especially to the two guys in our small town who did a good job this winter. This last snow we had in March I saw them out as usual so I stopped in the restaurant and paid for their breakfast and left their favorite box of Girl Scout cookies. Random me: What a gracious end to a difficult winter. Thank you everyone for following along on my 100 day challenge. And a HUGE thank you to all the participants what went out of their way to scatter kindness. #98 & 99 Random Act of Kindness – 100 day challenge. Yesterday I purchased sleeping bags for two young students who received tuition assistance to attend our Winter Nature Camp. The girls have faced a number of challenges in their young lives. Despite adversity, they are good students and enthused about learning. It has been so cold out lately and I know that they do not own sleeping bags. I’m hopeful that by surprising them with their very own sleeping bags, that they will have a memorable experience that will reinforce their desire to keep exploring, learning and growing. Random me: You just never know what a lasting impact you can make on someone else’s life.